The CAD systems that I design use functional representations to represent solid models. These f-reps need to be converted into meshes before they can be used in other programs (e.g. to be manufactured on a 3D printer). 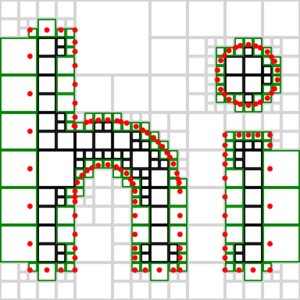 This write-up explores 2D implementations of a few common algorithms. We start with Marching Squares, then upgrade to Dual Contouring. 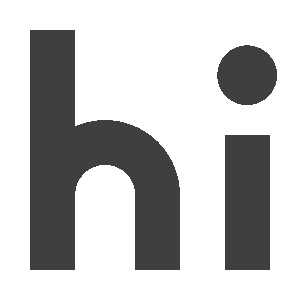 Also, we'll be using Haskell. Hold on to your hats! We'll start by defining a type for 2D points and a type for our shape functions. A shape function takes an (x,y) tuple and and returns a value. If this value is less than or equal to zero, the point (x,y) is inside the shape. 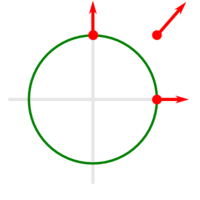 This function parameterizes a circle with a center and radius, then returns the distance from any point in the plane to the circle's edge. Thanks to partial application, you can call it with just (x,y) r arguments to get a Shape object out. The negation operator lets us make cutouts: subtracting b from a is given by a ∩ (inv b). Rendering this to a bitmap is a matter of evaluating the function on many (x,y) coordinates, then coloring them depending on the function's sign. This is a very naïve rendering strategy, but it's good enough to put pixels on the screen. 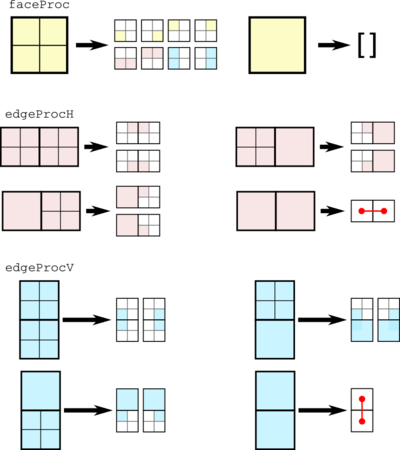 Quadtrees are a basic data structure in 2D graphics. 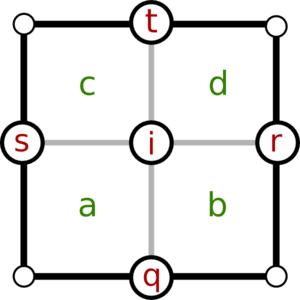 Quadtreees are hierarchical: a 2D region is recursively split into four quadrants; each quadrant is either a leaf cell or subdivided further. They are interesting because they represent a shape with fewer samples than a bitmap: areas that are completely filled or empty can be collapsed into a single cell. As motivation, here's a quadtree decomposition of our test shape. 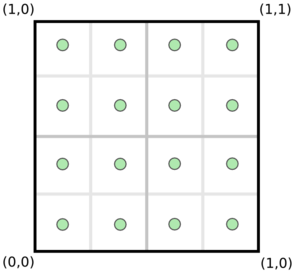 Green, grey, and black squares represent Leaf, Empty, and Full cells respectively. For the purposes of this exercise, we'll make a generic Tree_ type that stores some kind of data at each leaf, then specialize it to storing the leaf's corner positions. It may look like we're building a full tree here, but that's not quite the case. Because Haskell is lazy, this tree will actually be constructed on an as-needed basis, so we need not feel guilty about building it naïvely. Marching Squares is a fundamental algorithm for extracting isocontours from 2D samples. Each case creates between zero and two edges. Run this procedure on every contour-containing cell and you'll get your shape's contour. To get started, we'll encode the 16 cases shown above in a lookup table named lut. Next, we'll write helper functions that go from a Cell to an index in the lookup table and then to a list of Side pairs. Finally, we can combine these functions into one that converts a cell into a set of contours. Notice that this function can be applied to a tree with foldMap! There's an interesting nuance to our quadtrees: the collapse function treats sampled data as a binary value (based on whether it's less than zero). Can we do better by using the scalar value? The internal samples have different boolean values (some are inside the shape, some are outside), but all of the internal sampled values can be reconstructed from the corner values using bilinear interpolation. This means that we can merge the cells without losing any information! (This idea appears in the literature as Adaptively Sampled Distance Fields). This may seem like an uncommon occurance, but it turns out that this kind of merging is possible whenever a cell's distance field is entirely determined by a single line (or face in 3D). When working with flat surfaces, this happens a lot! As expected, we now see larger leaf cells containing a single flat edge. This seems too easy — what's the catch? This becomes a more significant issue in 3D: naïvely meshing a hierarchical structure will leave cracks in between cells of different sizes. 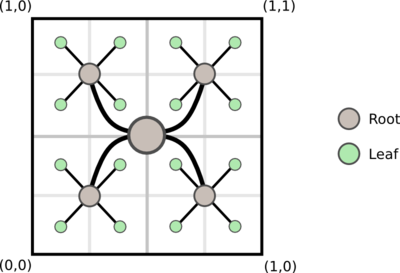 It does so by considering the dual graph of the quadtree. Instead of each leaf containing zero or more edges, each leaf stores a vertex; we connect these vertices to create the contour. 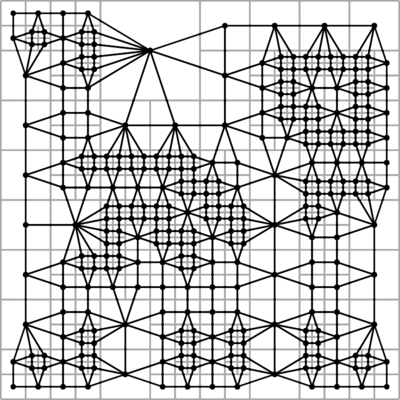 In this image, the original quadtree is drawn in light grey and the dual grid is shown in black. How do we choose which edges of the dual graph belong to the contour? How do we position the vertices of the dual graph within cells? How do we construct the dual graph? To answer the first question, we want to draw an edge between any two cells that share a side with a sign change. The answer to the second question is more subtle: we want to position vertices of the dual graph on features of the original shape. For example, in a cell containing a corner, the vertex should be on that corner. 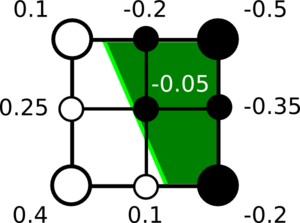 This strategy allows the algorithm to preserve sharp features. To find a feature in a cell, we find the position and normal of every point along the cell's sides that intersects the isosurface, then perform a least-squares fit to estimate the feature position. This is the same technique I use in Antimony, though we'll skip the sanity-checking for simplicity. The details are described in Feature Sensitive Surface Extraction from Volume Data. The code below uses the HMatrix library for matrix math. This looks promising! There's one remaining step: to link these points together into a shape-outlining contour. 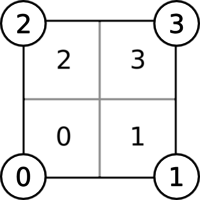 We use a set of three recursive functions to isolate edges of the dual graph. They're tricky, so I'll present them three times: in a diagram, in plain English, and in code. faceProc is called on one cell. If that cell is a leaf, then it returns nothing. 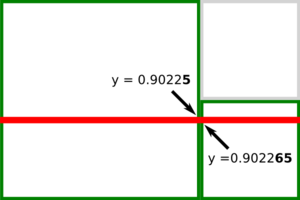 If that cell is a root, it recurses by calling faceProc on each subtree, edgeProcH on each horizontal pair of cells, and edgeProcV on each vertical pair of cells. edgeProcH is called on a pair of cells. If both are leafs, it creates a contour edge between the two cells. Otherwise, it recursively calls itself on two horizontal pairs of cells. edgeProcV is identical to edgeProcH, but applies to vertical pairs of cells. At this point, we'll declare victory: the contour is a faithful representation of the original shape and point density along the contour scales with local complexity / curvature. There's plenty more to dive into in the literature, with references below. Thanks to Richard Bowen and Michael Gilik for their feedback on an early draft. Download the source here (including code used to generate diagrams).